Using Hive, you can create managed tables or external tables. In Hive 3, Hive has full control over managed tables. Only through Hive can you access and change the data in managed tables. Managed tables, except temporary tables, are transactional tables having ACID (atomicity, consistency, isolation, and durability) properties. Because Hive has full control of managed tables, Hive can optimize these tables extensively. If you need to bypass Hive to access data directly on the file system, you use external tables or a storage handler, such as Druid or HBase. The following matrix lists the types of tables you can create using Hive, whether or not ACID properties are supported, required storage format, and key SQL operations. Although you cannot use the SQL UPDATE or DELETE statements to delete data in some types of tables, you can use DROP PARTITION on any table type to delete the data. The managed table storage type is Optimized Row Column (ORC) by default. 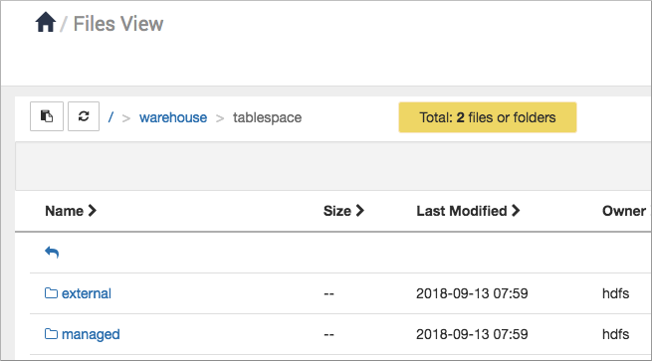 If you accept the default by not specifying any storage during table creation, or if you specify ORC storage, the result is an ACID table with insert, update, and delete (CRUD) capabilities. If you specify any other storage type, such as text, CSV, AVRO, or JSON, the result is an insert-only ACID table. You cannot update or delete columns in the table. Transactional (ACID) tables reside in the Hive warehouse. To achieve ACID compliance, Hive has to manage the table, including access to the table data. The data in CRUD (create, retrieve, update, and delete) tables must be in ORC file format. Insert-only tables support all file formats. Hive is designed to support a relatively low rate of transactions, as opposed to serving as an online analytical processing (OLAP) system. You can use the SHOW TRANSACTIONS command to list open and aborted transactions. Transactional tables in Hive 3 are on a par with non-ACID tables. No bucketing or sorting is required in Hive 3 transactional tables. These tables are compatible with native cloud storage. Hive supports one statement per transaction, which can include any number of rows, partitions, or tables. When you run DROP TABLE on an external table, by default Hive drops only the metadata (schema). If you want the DROP TABLE command to also remove the actual data in the external table, as DROP TABLE does on a managed table, you need to set the external.table.purge property to true as described later. To determine the managed or external table type, you can run the DESCRIBE EXTENDED table_name command. Hive is not designed to replace systems such as MySQL or HBase. If upgrading from an earlier version to Hive 3, you must run a major compaction to use your transactional tables. You can create a transactional table using any storage format if you do not require update and delete capability. You use an external table, which is a table that Hive does not manage, to import data from a file on HDFS, or another file system, into Hive. When you run DROP TABLE on an external table, by default Hive drops only the metadata (schema). If you want the DROP TABLE command to also remove the actual data in the external table, as DROP TABLE does on a managed table, you need to configure the table properties accordingly. Knowing how Hive converts tables from flat to transactional, and being aware of the operations that are supported by the conversion, helps you transition pre-existing tables to Hive 3.